Following the first race of the Firestone Twin 275s, winner Dario Franchitti celebrated quickly as he contemplated the uncertainty of a random draw for starting positions in race 2 at Texas Motor Speedway. Having the potential of drastically shuffling the starting order from the race results of race 1, the Firestone Twin 275s second race was decided with drivers selecting a numbered Firestone tire on a large wall. Operating in reverse order to their finishing positions, drivers drew in front of the Texas Motor Speedway crowd their starting spots in the second race. Drawing the 1st place spot was KV Racing Technology driver Tony Kanaan. An elated Brazilian, Kanaan literary jumped as he followed the Texas Motor Speedway's advice through the selection procedure. As for Dario Franchitti, the winner of the first race was ushered to a 28th place starting spot. Runner-up in that earlier race, Franchitti's Target-Chip Ganassi Racing teammate started 18th for the second race. Deeply buried in the second of the Firestone Twin 275s at Texas Motor Speedway, Franchitti appeared to continually exhibit displeasure in this procedure. Following the first race of the IZOD INDYCAR double race, there were two cars (the #98 of Wade Cunningham and the #83 of Charlie Kimball) too damaged to complete the 114-lap distance. A unique twist in this Firestone Twin 275s event, drivers and teams who are out of the first race were permitted a back-up car to be involved with the second race. For the Bryan Herta Autosport team of Wade Cunningham set to start on the front row, their limited resources had the race organization seeking out and receiving Alex Tagliani's back-up car from Sam Schmidt Racing. All teams received only an hour to tune their vehicles for the second Firestone Twin 275s event. With Tony Kanaan leading the field for race two for the IZOD INDYCAR Series at Texas Motor Speedway, his KV Racing Technology car launched perfectly in the pole position while second place starting Wade Cunningham began a descent down the running order. Only his second race in the IZOD INDYCAR Series (the first occurring just about two hours prior), rookie Cunningham was also getting initiated with an unfamiliar Dallara-Honda race car. Cunningham would finish the second event in 28th place for Bryan Herta Autosport. Able only to find pace for 11th place in the earlier race, Tony Kanaan found the clean air out in front of the IZOD INDYCAR Series competition refreshing on his race car. Kanaan held with gusto during the early stages of the Firestone Twin 275s. Behind him, the field shuffled around as positions swapped between faster cars coming from the back passing slower vehicles. Making moves quickly in the second race segment at Texas was Penske Racing driver Ryan Briscoe. From 12th place on the start, Briscoe (the winner of a longer length race at Texas Motor Speedway last year) diced through the top-10. At one point, the #6 car of Ryan Briscoe caught an anxious moment where he wiped the front infield grass with his left Firestone tires. As Ryan Briscoe showed the black, white and red Penske colours, Helio Castroneves' #3 AAA car also made his blue, white and red paint scheme very visible through the second race at Texas Motor Speedway. Starting 6th, Castroneves preserved a strong run in the top-5 after a less than special showing in the first event earlier in the night. Besides the Penske cars, other drivers turning the lemons of a poor starting spot draw into the lemonade of a hard-earned race run included Marco Andretti and EJ Viso. After both races were in the books, Andretti and Viso each gained a total of 31 spots on the race track from there starting positions. Having one of the better races of his 2011 season for KJ Racing Technology earning two top-10 finishes at Texas Motor Speedway. As for Viso's teammate in the #82 car, Tony Kanaan would until the #12 Penske Racing car of Will Power began to thunder up on his Lotus green race car. Sizing up Kanaan for several laps, Power was finally able to pass the #82 KV Racing car on lap 31 just ahead of the first pit stops of the 114-lap late race. Maintaining the front spot through the first round of pit road stops, Will Power's hold on the top position was familiar to the performance which Dario Franchitti displayed in the first Firestone Twin 275s. As for Franchitti, the Scottish driver did not find charging up from the 28th spot an easy task. Making only small gains through the initial laps, Dario Franchitti's #10 would only find the top-10 in the late going at Texas Motor Speedway's IZOD INDYCAR race. As for teammate Scott Dixon, he would draw closely back into the lead pack coming from his 18th place position at the drop of the green flag. 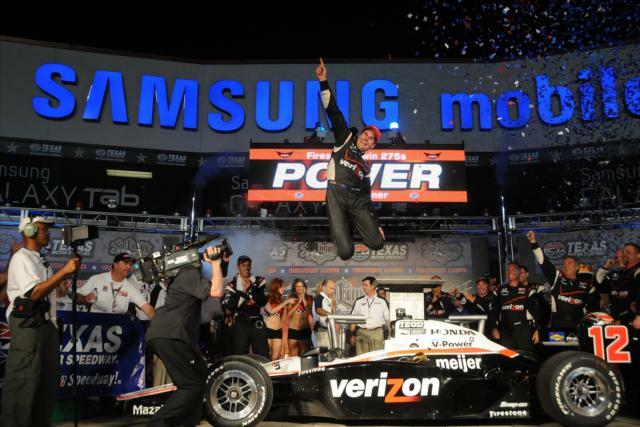 As the race ran caution-free through its entire 114-lap distance, Penske Racing's Will Power had a win in his grasp. however, on lap 104 the Australian's hold on the event could have been loosened as Power aimed for his second and final pit stop. Chip Ganassi Racing's #38 car driven by Graham Rahal ran out of fuel on along the track's backstretch. Rightfully keeping his coasting car down at the lower edge of the race track, Will Power quickly approached the slower car as he himself was low on entrance to pit lane. Taking quick evasive actions, Will Power dived just between Rahal and the inside retaining wall in a masterful move to avoid a horrific incident. "I wasn't sure whether he was coming out of the pits or he was actually pitting or what he was doing." Power said. "I actually probably thought he was coming out of the pits, so I went to the inside, because I was pitting. There was a massive closing speed there. I'm glad he stayed straight. That could have been pretty big had he gone the wrong way." Undaunted through the final 10 laps, Will Power took his first victory in his career on an oval race track. While the oval tracks were considered the Australian's Achilles heel, Power kicked up his heels in Texas winning the second Firestone Twin 275s and his third victory of the still young 2011 IZOD INDYCAR Series season. Will Power said in post-race "The second race, obviously the draw definitely helps. We got out in front. But we had a really quick car." Closing but running out of laps, Scott Dixon charged to a second runner-up spot for the night in his #9 Target car. Describing the entire night as a throw-back to his go-karting days, Dixon commented on the twin race format of Texas saying "I think it's a good concept. I think it could be tweaked a little. It's a little gimmicky for a championship points race, which I think that's what concerns a lot of people." Ryan Briscoe, Helio Castroneves and Tony Kanaan rounded out the top-5 for the second event of the Firestone Twin 275s. Coming home in 7th place, Dario Franchitti brought his #10 car across the line with some sore feelings on this double race. After the race Franchitti vented "The first thing is we should never have been in that position to start with. To have a championship in the IndyCar Series, drawing the grid out of a hat is a joke. Through no fault of our own, we started 25 places behind Will. Will, he took advantage of it tonight and did a great job. Through no fault of myself or the Target team, we had a massive handicap." Will Power takes a 21-point lead over Dario Franchitti to the Milwaukee Mile race on June 19th.